Ali (Matthias Schoenaerts – Bullhead) dreams of becoming a professional boxer. When he is suddenly put in charge of his five-year-old son, he moves in with his sister for support. While at his new job as a nightclub bouncer, he meets the beautiful and confident orca trainer, Stephanie (Marion Cotillard – La Vie en Rose, The Dark Knight Rises). He gives her his number, not expecting that she will ever call. However, after becoming the victim of a tragic and life changing accident, Stephanie surprisingly turns to Ali for support. These lost souls discover new meaning in life together when Ali enters the dangerous world of underground boxing. Following a theatrical opening to tremendous national and international acclaim, and a Best Film Award at the London Film Festival in October, Jacques Audiard, acclaimed director of A Prophet and The Beat That My Heart Skipped, returns with this bruising and powerful drama about two people from very different worlds, seeking redemption in each other. Winner of several international awards, Rust and Bone (De rouille et d'os) is one of the best and most talked about films of 2012. With 2 BAFTA nominations, the film is up for Best Leading Actress (Marion Cotillard) and Best Film not in the English Language. 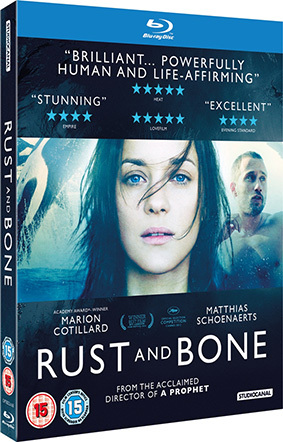 Rust and Bone will be released on UK Blu-ray and DVD on 25th February 2013 by Studiocanal at the RRP of £22.99 for the Blu-ray and £17.99 for the DVD. You can read Timothy E. RAW's review of the film and watch his interviews with lead actors Marion Cotillard and Matthias Schoenaerts, director and co-writer Jacques Audiard and co-writer Thomas Bidegain here.